My first trip to Philadelphia five years ago was not so great. My umbrella was stolen. That’s it. That’s my big reveal. Not even a super interesting story either. I went to a corner store on South Street. It was raining. The shop owner asked me to leave my wet umbrella at the door so I did, along with several others. When I went to leave the store after shopping, my compact, automatic up AND down umbrella was gone. No doubt keeping some formerly umbrella-less bandit perfectly dry. Welcome to the group of people who has now heard the “my-umbrella-was-stolen” story. Which is pretty much everyone on Earth. So that’s my Philadelphia story. And until recently, it’s the only memory I had of this so-called City of Brotherly Love. Hmph. Some love. When the mister asked me to be his plus one at a Philadelphia wedding, I eventually acquiesced. He’s originally from Jamaica but moved to Philadelphia as a child with his family. So Philly is basically where he’s from. 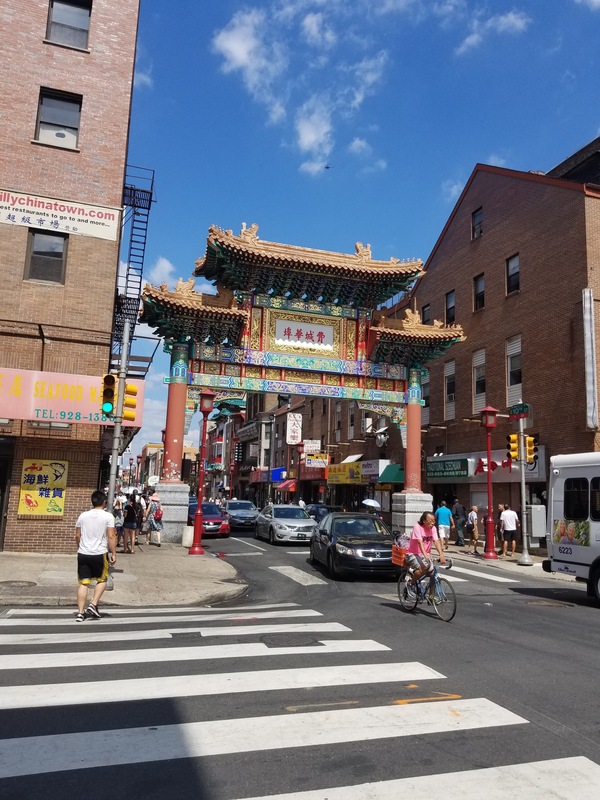 Though I didn’t love Philly my first time around, I was curious about experiencing it with a local. So off we went. First impression upon landing back in this city that abducted my polka dotted parasol: DIRTY, potholes and broken roads, smileless faces. And if I would have left on day one and not given Philly a shot, I would have left with that impression. To make a super long story short: what saved Philly for me was the food! I know I know, not the first thing you may have thought of for this city known for its history, the Liberty Bell and Rocky. But I’m telling you. 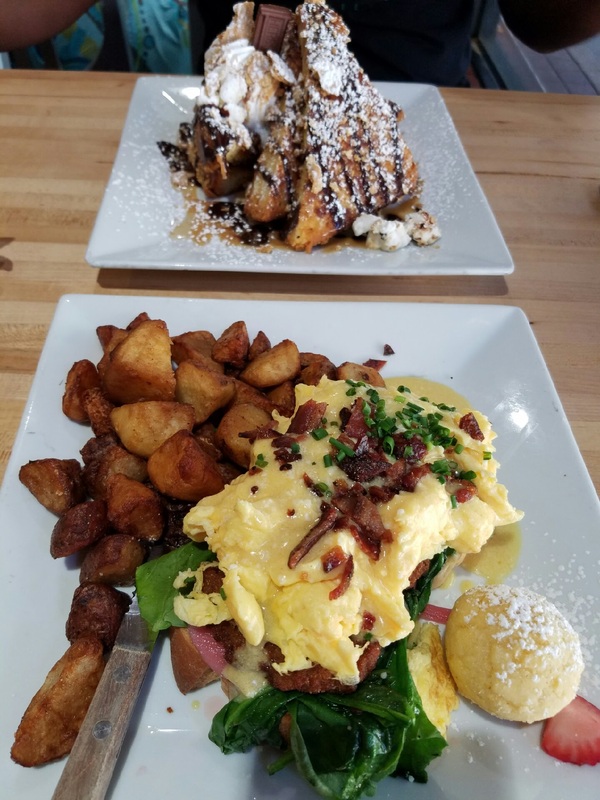 It’s all about the food. Oh and also I did see some people get into an argument on the street complete with Arguer A jumping out of her car, pulling up her dress and bending over in Arguer B’s face while smacking her rump, not so kindly instructing Arguer B to kiss her you know what. It was magical. Back to food though. West Philly is not a place you go unless you know someone there. Thankfully, I did. It’s the literal definition of “around the way” but the first spot we happened upon, Crafty Soul, was home to the best lamb chops I’ve ever had in my entire life on Earth. I’m still chasing that high today. 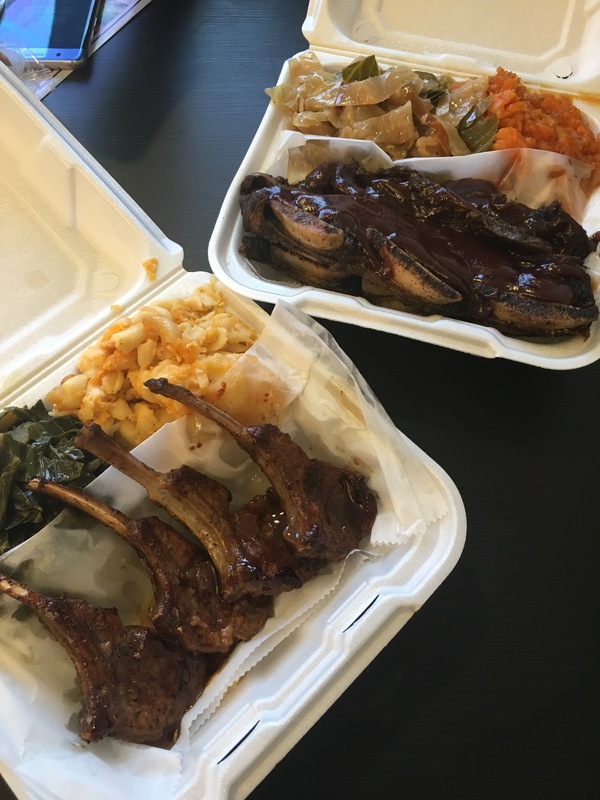 Lamb chops and short ribs from Crafty Soul. Best soul food in West Philly. Best stop the next day was Reading Terminal Market. So much so that we ate there multiple times at different places each day. I don’t have to do a write up on Reading Terminal Market. There are probably hundreds. Google it. 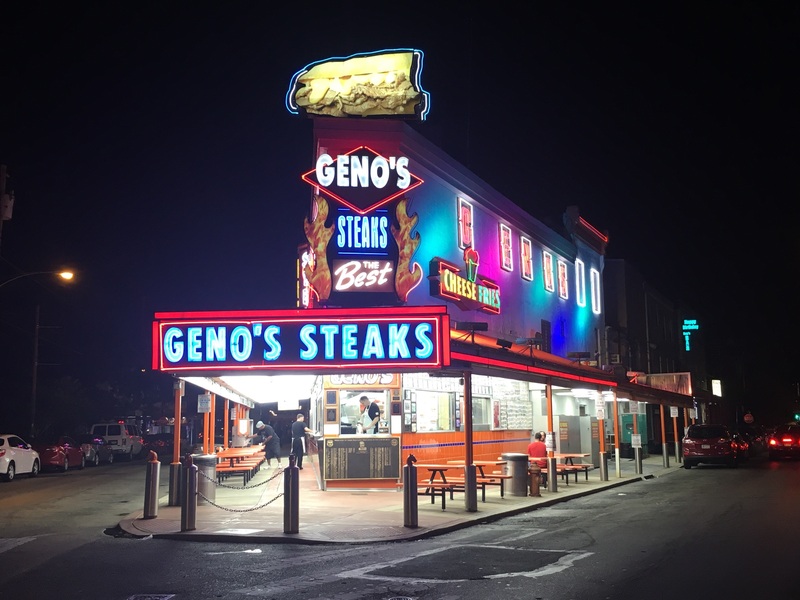 Just make sure you go there if you ever go to Philadelphia. More food pics. Brunch at the Reading Terminal Market Oyster Bar. 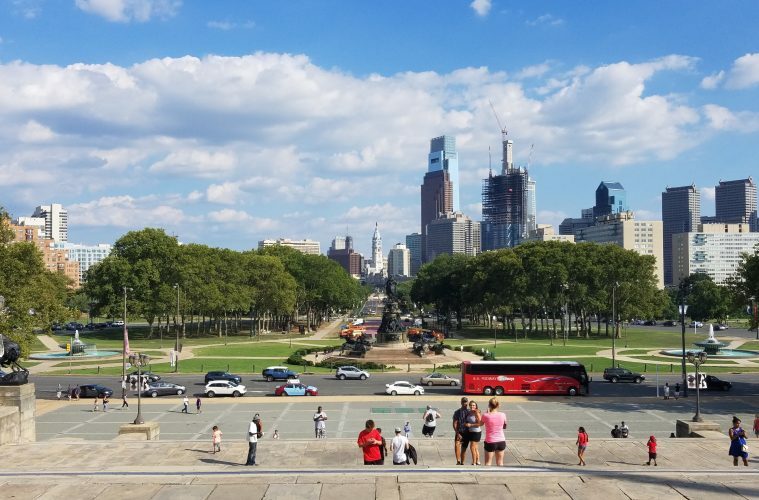 Beyond the food, there are the typical Philly attractions and the not so typical. Of the attractions, the African American museum made an impression on me but not entirely for its content. More so because it’s directly across the street from the detention center. 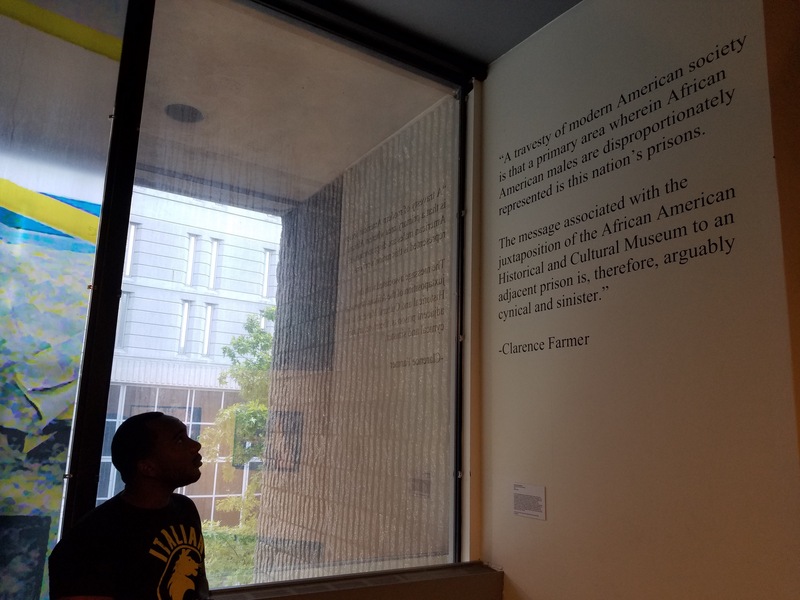 The irony of that juxtaposition was not lost on me, nor on the creators of the museum itself, as the internal wall facing the detention center directly addresses the issue of mass incarceration among African Americans. There was some good stuff in that museum. 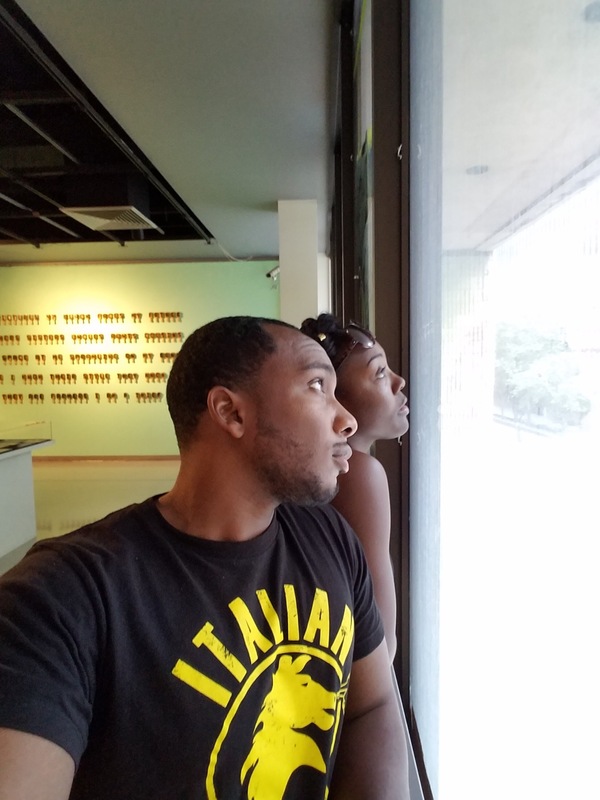 Gazing at the prison from a place of privilege. Knowledge, in the form of a museum, as freedom. 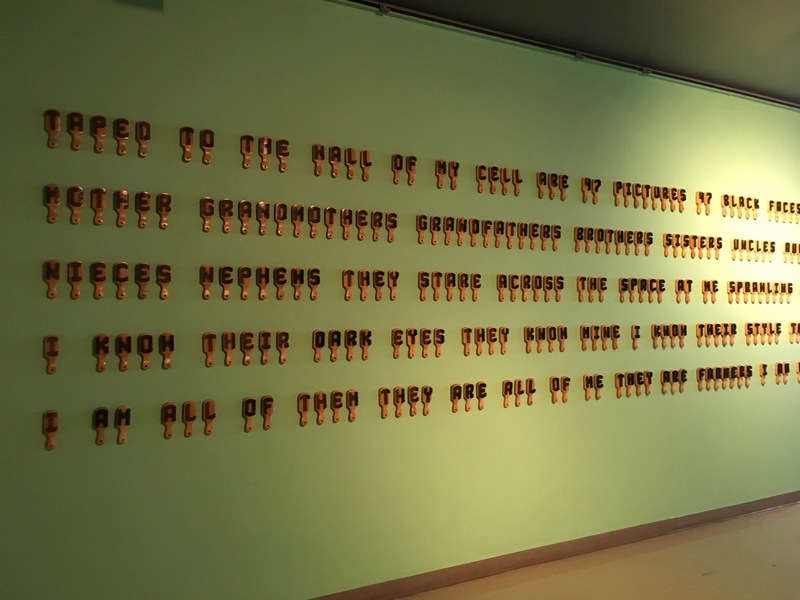 An exhibit at the African American history museum. It’s made of brushes. 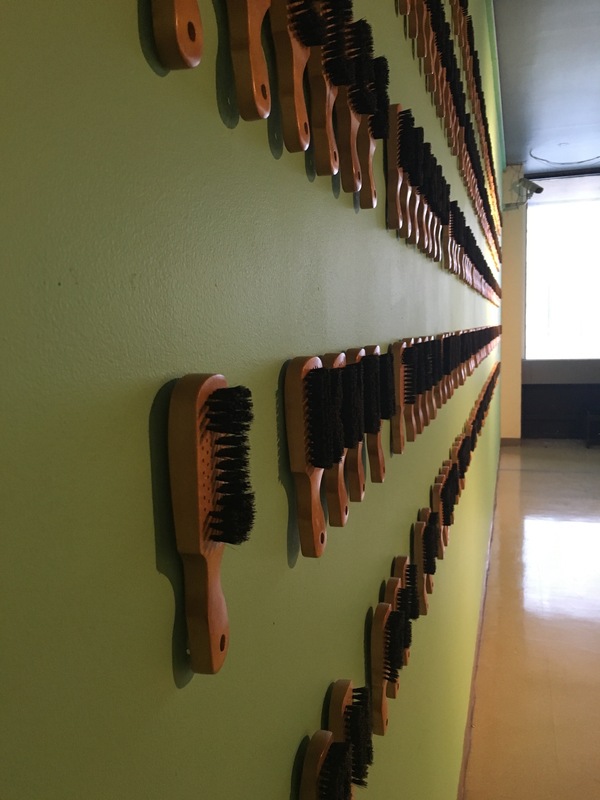 A closeup of the brushes. The museum wall facing the prison. The irony of it was purposeful. By the time I left this Birthplace of America, my opinion had all but done a complete 180 degree turn. I wouldn’t say I’m love with Philadelphia but I don’t dislike it anymore. I even revisited the scene of the crime on South Street, the very same shop, and not one belonging of mine was stolen. Score! Bottom line: Eat good food and snag a local as a tour guide. It makes a world of difference for any place you may visit. Even if you hated it the first time. 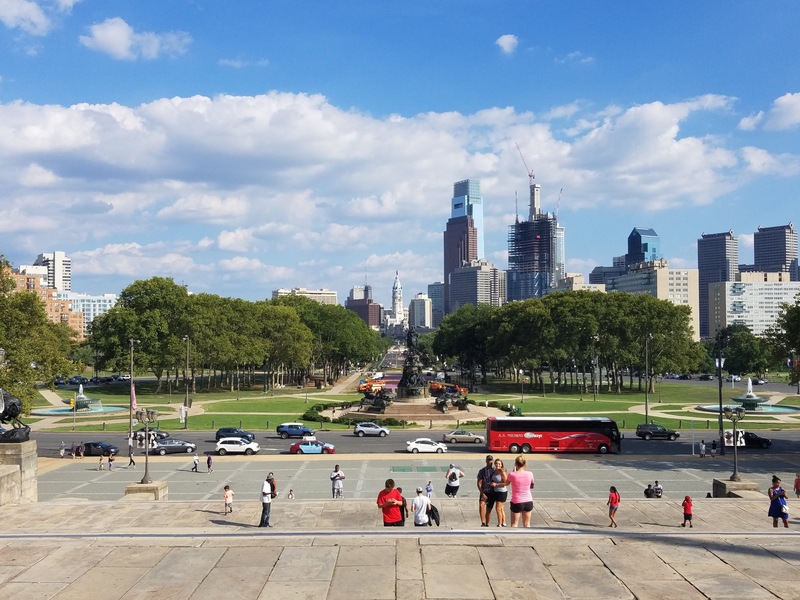 View of the city from the art museum steps. Chinatown hidden in the middle of the city. 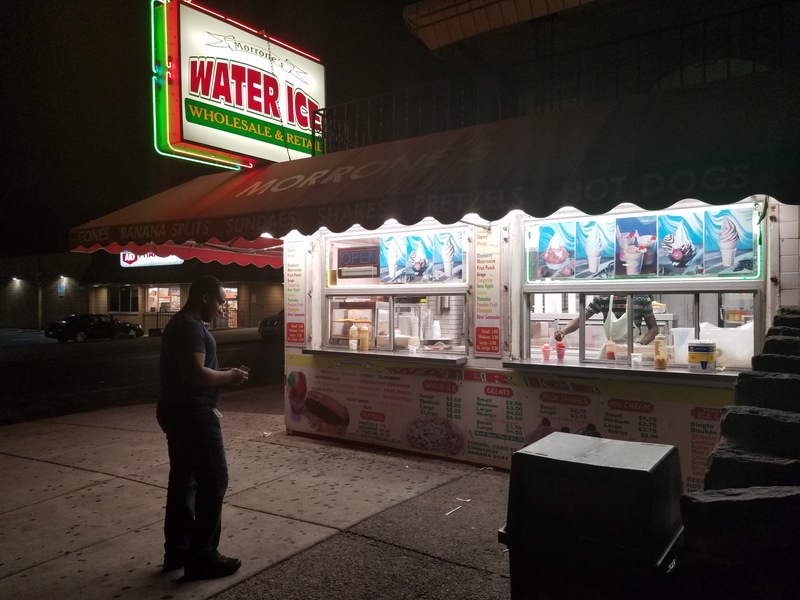 My first encounter with a local love: water ice. Geno’s is for tourists only so we didn’t eat there. Rookie mistake.